RightWriter is unbelievably simple to use. You just copy and paste your text, then click Analyze for the result. It couldn't be easier. RightWriter works with any text or document application. RightWriter is ready when you are and it only takes three clicks. Get it done fast so you can do something fun. Save yourself hours of proofreading time. RightWriter zeros in on the trouble spots in seconds so you finish sooner. No matter how many times you read a document, you will miss an error somewhere. RightWriter never becomes bored. RightWriter is the smart choice. Compatible with Windows XP/Vista/Win 7, Win 8 and later, 32 and 64 bit versions. SPECIAL BONUS: If you order by clicking the below button, you will also receive a video grammar course called Speak English Like A Genius which gives you the tricks needed to improve your grammar. This course includes simple tricks you can use to instantly impove your grammar. 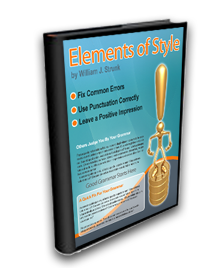 You will also receive a free eBook of William J. Strunk's Elements of Style. This is THE grammar standard. In only 45 pages it summarizes the most common grammar errors and how you can avoid them. This is a limited time offer so don't miss your free eBook bonus. seeking or obtaining a better paying job? Is your writing holding you back in school? RightWriter solves your writing problems. Is your grammar not as better as it should ought to be? Does your writing make you sound less intelligent than it should? Is your writing weak? Do you wonder how many errors in your documents go unnoticed by you? RightWriter can fix your grammar and writing problems instantly and make your writing look intelligent, polished and professional. Imagine having your own private English Teacher available to proofread everything you write. RightWriter is even better because it is faster and more thorough. RightWriter is much more than a simple grammar analysis tool. It analyzes your writing as a whole. It finds not only grammar errors, but it warns you when it finds weak writing style. It also shows you how to improve those weak areas. Even when your grammar is technically correct, there may be parts of your writing that can be improved. Simply removing or changing a word can make your meaning clearer. RightWriter uses the unique SmartGrammar™ analysis engine which performs advanced and context-based checks for errors in grammar, spelling, and punctuation. A well written report can make the difference between receiving a grade of A+ or D-. A well written cover letter can mean the difference between getting a job or remaining unemployed. An email or blog post with proper grammar can make the difference between appearing ignorant or intelligent or between being taken seriously or dismissed as unimportant. Do you want your writing dismissed by those who read it? Then here is how you can improve your writing. Even if you know nothing about Grammar Rules, you can use RightWriter to fix your writing. RightWriter is simple to use. Do you want to make your writing impressive? Do you want other people to see you as intelligent? Do you want an easy, quick-fix for grammar problems? Then download your copy and start using it in the next two minutes. Click Here Now. You can always express your ideas more effectively when your writing is grammatically correct. RightWriter will separate your writing from those around you. No matter what your writing goals are, RightWriter can improve your writing's impact. RightWriter is the software tool that actually improves your grammar skills. You don't have to understand grammar rules to use RightWriter. RightWriter will show you the problem area and make suggestions explaining how to fix it. The more you use RightWriter, the more you will naturally begin to spot grammar problems and the more your grammar skills will improve. RightWriter is the Fastest and Easiest to use grammar tool available. You do not have to understand grammar rules. Just copy and paste your text, then BAM! You have the corrections listed right in front of you. This is the best way to improve your writing, hands down! See more about how it works on the demonstration page. SPECIAL BONUS: If you order now, you will also receive a free eBook of William J. Strunk's Elements of Style. This is THE grammar standard. In only 45 pages, it summarizes the most common grammar errors and how you can avoid them. This is a limited time offer so don't miss your free eBook bonus. ADDITIONAL VIDEO BONUS: If you order by clicking the below button, you will also receive a video grammar course called Speak English Like A Genius which reveals simple tricks you can use to improve your grammar instantly. You can Download Immediately after completing checkout and receive instant access to the bonus video grammar course! 100% Guarantee: Your Writing Will Improve. Your writing and grammar will improve after 30 days using this software GUARANTEED. If your writing does not improve after 30 days or if you are not satisfied for any reason within 30 days of purchase, just contact us for a refund. No catches, no hoops to jump through. I know that you, just like thousands of other users, will be satisfied at the results you see when you begin handing in work that uses proper grammar. People will treat you differently and react to your work in a positive way. You have nothing to lose and everything to gain. 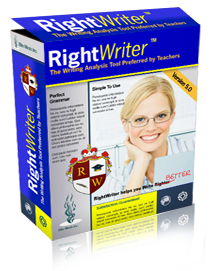 Click the below button and you can download your copy of RightWriter in the next two minutes to improve your writing. RightWriter makes Grammar Correction as simple as clicking your mouse. Select the text you want to analyze, drag it into RightWriter, click Analyze, and see the results immediately. It is the easiest and fastest way to improve your writing. Whether you like it or not, people judge you by how well you write. When you write for your friends, your boss, a business client, your teacher, or even post to a blog, people will judge you by how well you express yourself. They never say anything when they see mistakes, but they notice. Rightwriter software is what you need to improve your grammar. Right Writer is the best choice. Rite righter also known as right write, and rite write, and wright writer, as well as sometimes called write write or even mis named right riter is all the same product. Writing software is important to writers. English grammar software for software grammar correction of English grammer is an important writing tool. You may know English writing software has been available some time but not like this English writing. Our English grammar checker is the most advanced checker you can buy. Grammar check english even if it is a second language for you. Ggrammar checker has many features. Check grammar software and punctuation and other grammar check features, not just structure. English writing grammar is important in business and school. Basic english grammar is critical to being taken seriously in writing. Writing and grammar are used today on the internet more than ever in past history. Improve writing english with this tool It is better than online grammar tools. It is much easier to use than Writer's WOrkbench or writers workbench. The writer workbench software is very advanced and has many features no one will ever use. Most people give up trying because it is not easy to use. RightWriter is easy to use. Dont think this writers workbench review is biased, see the demo yourself. Grammatical analysis software is important to projecting the right image. Right Writer is the perfect lexical analysis tool.